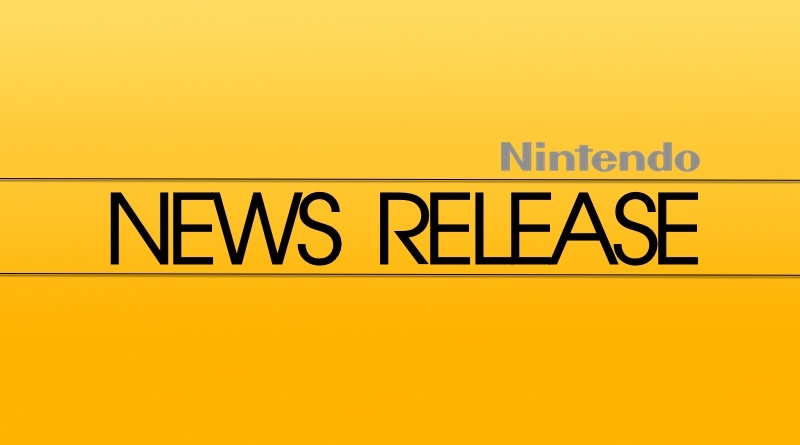 Nintendo sent out an official press release today introducing the country to the Nintendo Entertainment System (NES). Although it has been available since last October in New York as part of a test market, the NES is just now being released on the west coast in and around the Los Angeles area. 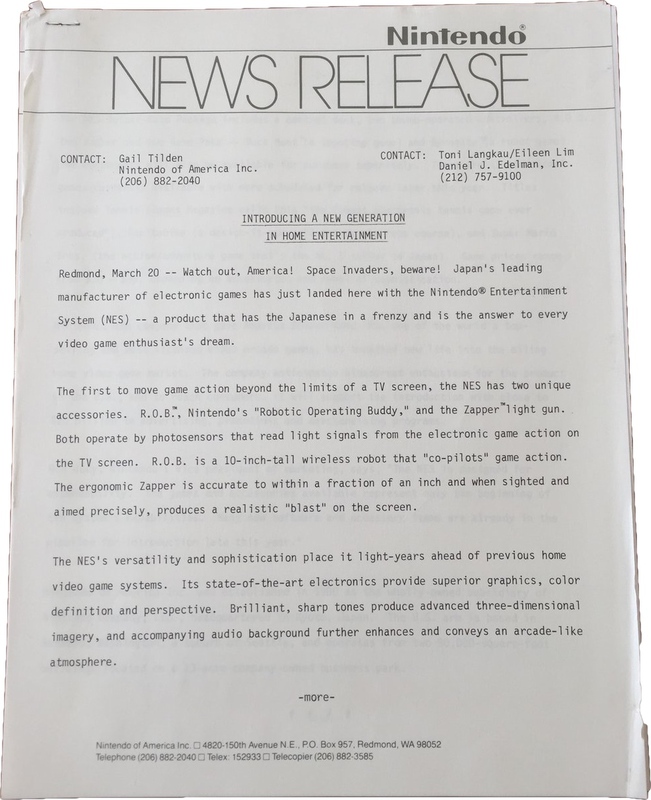 Retail has been cautious to carry the product because of the massive losses incurred throughout 1984 as most stores dumped video games altogether in favor of computers. Nintendo has made some headway in getting retailers to carry the NES and many have reported selling out of the consoles, a good indication that Nintendo may be on the right track to revitalizing the industry. The NES has a lot going for it. It looks very different from prior systems, with a unique door that opens up to place the cartridge inside the system. No longer are you using joysticks as the two rectangular controllers that come bundled in utilize a cross pad to move around in four directions and two red action buttons “A” and “B” that perform various actions depending on the games. 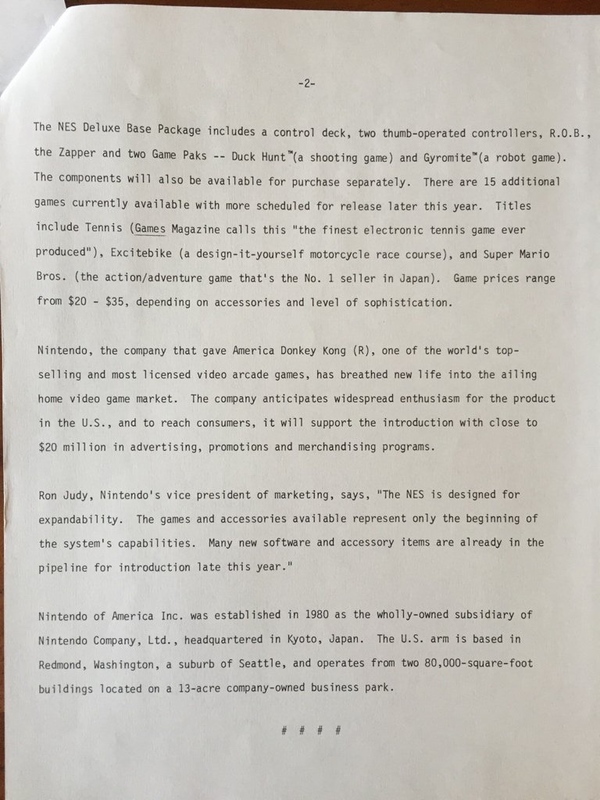 In addition, the NES Deluxe Base Package (as Nintendo is now calling it) contains a Zapper light gun that allows gamers to take aim at the TV and shoot down ducks in Duck Hunt (included in the box) or take down bad guys in games like Hogan’s Alley. Finally, and perhaps the most compelling, is R.O.B., the interactive “Robotic Operating Buddy” that can help out the player in games like Gyromite (packed in) and Stack-Up. Nintendo doesn’t list a suggested retail price for the NES, but most stores are selling it for around $140. These extra games will range between $20 and $35. We do have reviews up for several of the games (clickable above), but the obvious first purchase should be the impeccable Super Mario Bros. It’s a game so chock full of secrets and amazing world to discover that it will keep you entertained for months on end. It shows off what the NES is truly capable of with imaginative level designs, crisp and engaging graphics, and a musical soundtrack that drills down into your brain to the point where you shouldn’t be surprised to find yourself humming or whistling a few of the tunes long after you’ve turned the system off. We are working to get some advanced copies of the upcoming games for previews. We hope to have access to many of these games in May to give you an idea of which ones to really look forward to. As for the rest of the country, Nintendo hasn’t revealed when or where the next distribution of systems will take place. We do know it’s going to take awhile for the NES to appear in every state, with Nintendo saying it expects the nationwide rollout to be complete by this fall. We will notify you as we hear of more cities being added to the distribution list. If you absolutely can’t wait, you could always check in with a friend or family member to see if they could send you one through the mail, or check in with some retailers that offer mail order, such as FAO Schwarz.